There will be more than fireworks to celebrate at the Rainbows Fireworks Spectacular this year as Aggregate Industries launch its brand new paver. Weighing almost 22 tonnes and capable of paving widths up to 16 metres, the Volvo 9280 is the first paver of this size sold in the UK in over 15 years. 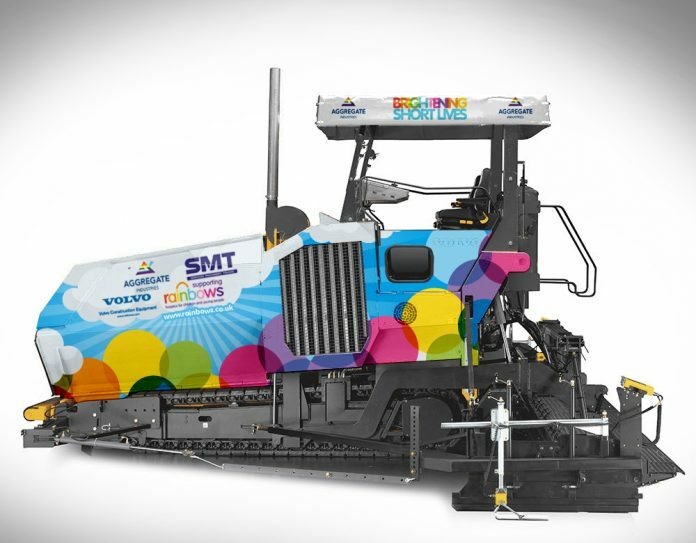 Aggregate Industries will be using the machinery to show its support for Rainbows Hospice for Children and Young People, the East Midlands’ only hospice for youngsters with life-limiting conditions. The unit will even be branded in Rainbows colours and will be launched at the charity’s annual fireworks display, which takes place at Leicester Racecourse. The Paver is destined to start work on the new A14 Huntingdon Bypass in Cambridgeshire. It will stop off at Leicester Racecourse on the way down from Immingham to be part of the Rainbows Fireworks Spectacular. Craig Flowers, National Plant and Transport Manager at Aggregate Industries, said: “The new paver is a great addition to our fleet of Surfacing equipment. We wanted to do something special as it’s such a unique machine, so the Paver will be branded in the colours of Rainbows Hospice. “I feel extremely proud that Aggregate Industries have allowed me to do something a little special to one of our fleet and support such a great cause which I am hoping will not only raise the profile of Rainbows but help generate much needed funds to allow them to help and support not only the children with life-limiting illnesses but their families also. As well as the paver featuring the Rainbows logo and branding, four employees from Aggregate Industries and SMT will be tackling the Cambridge marathon in March 2019 to help fundraise even more for the hospice. Tom Stanyard, Corporate Partnership Fundraiser at Rainbows, said: “We’re really excited to see the new paver at the racecourse on the 3rd November. Along with the paver there will also be some other construction equipment from Collins Earthworks and CRH Construction on display, so it’s going to be like a small showroom!